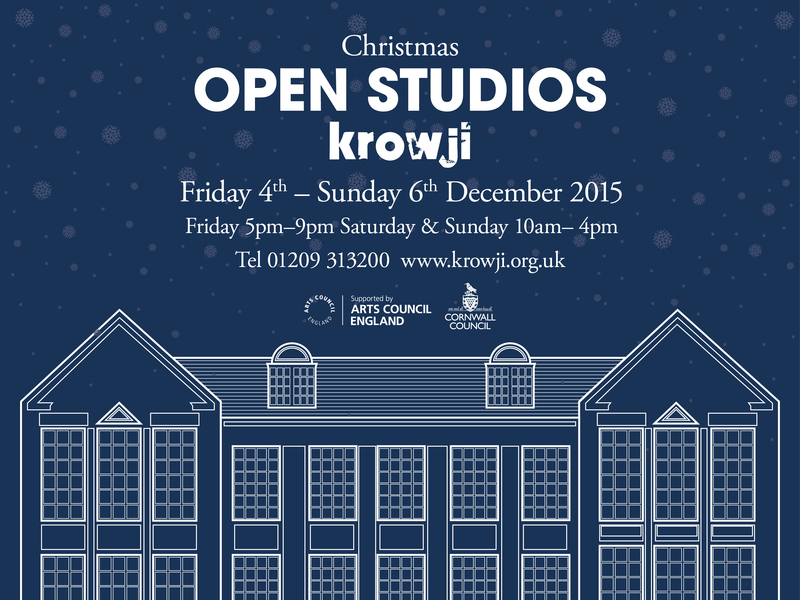 A diverse range of creative practitioners took part in Krowji’s Christmas Open Studios 2015 event, selling gifts and artwork to the hundreds of visitors who came to look around the site. Artists included ceramicist Agnieszka Niesluchowska, painter Alasdair Lindsay and one of our newest tenants, painter Ella Carty along with many other creatives who rent their studio space from Krowji. We recieved this lovely review from blogger Sophie Brough-Orton. ‘Wow. Visiting ‘Cornwall’s creative work hub’ over the weekend left me feeling inspired, in awe of the makers there and if I’m being honest – pleasantly and utterly surprised. 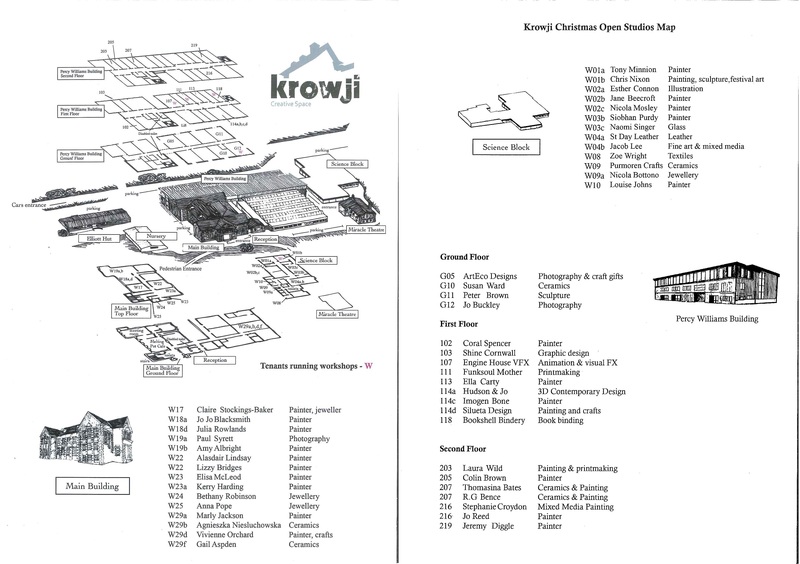 I hadn’t visited the Krowji community before, and so when I discovered they were opening their studio doors to the public one winter weekend I was naturally curious and wanted to have a nosy. I wasn’t sure what I expected – perhaps a few painters standing by their recent collections, a potter turning clay at their wheel, but I was definitely wrong – it was so much more than that (and then a bit more too)! For the starters, the creative space is huge! With various blocks, buildings and floors I easily managed to while away the entire morning exploring the studios and talking to the artists and designers about their displayed work. Although there were delicious pieces on show for sale, (tempting me with even more present purchases for Christmas) the Krowji tenants didn’t try and hide their studio as their actual workspace either. The self guided tour was an amazing insight into how these creatives utilise their space; with sketchbooks, scribbles and photographs scattering the floors, walls and desks of each room, I felt incredibly lucky to get to see first hand their ideas and processes. Joanne Reed is a fine artist and it was her lovely use of a tropical green palette that initially drew me in. There is something very exotic about her work, and the reminder of a warmer climate is always a winner with me – especially when the Cornish wind is making it’s debut! Her painterly strokes have both loose and definitive qualities, and there is something narrative about the subject matter she chooses to paint that is intriguing and curious. Anyone who knows me, knows about my love of Japan and the exquisite aesthetic that comes with it. So of course, walking into Purmoren Crafts’ studio resulted in a lot of “ooos” and “ahhs”.Teapots, rice bowls, chopstick rests – you could easily deck your kitchen out with a whole set of lovely Japanese-style ceramics with the help of Kathryn Watson (the creative behind Purmoren Crafts).If you’re also a fan of this type of handcrafted, gentle and considered design work, then exciting news – Kathryn will be opening an online shop very soon (keep an eye out)! Agnieszka Niesluchowska, Alasdair Lindsay, Amy Albright, Anna Pope, ArtEco Designs, Bethany Robinson, Bettina Holland, Bookshell Bindery, Chris Nixon, Claire Stockings-Baker, Colin Brown, Coral Spencer, Elisa McLeod, Ella Carty, Engine House VFX, Esther Connon, Funk Soul Mother, Gail Aspden, Hudson & Jo, Imogen Bone, Jacob Lee, Jane Beecroft, Jeremy Diggle, Jo Buckley, Joanne Reed, Jo Blacksmith, Julia Rowlands, Kerry Harding, Lizzy Bridges, Lou Johns, Marly Jackson, Naomi Singer, Nicola Bottono, Nicola Mosley, Paul Syrett, Peter Brown , Purmoren Crafts, R.G Bence, Silueta Designs, Siobhan Purdy, St Day Leather, Stephanie Croydon, Susan Ward, Thomasina Bates, Tony Minnion, Vivienne Orchard & Zoe Wright. Overall it was an inspiring weekend enjoyed by all! Not to worry if you’ve missed out, the next Open Studios will be coming up soon. Sign up to our mailing list to keep updated. 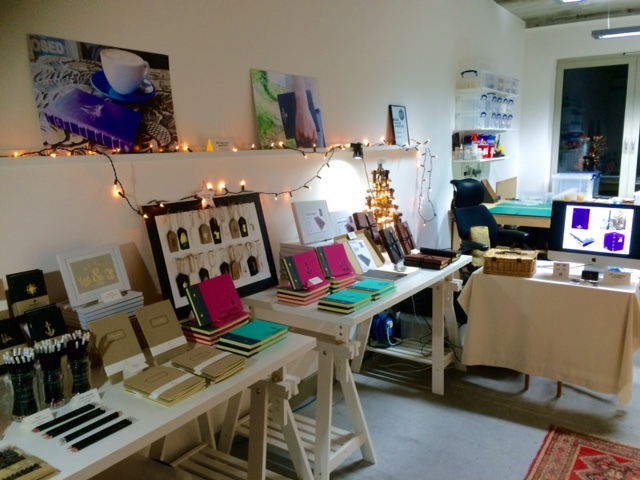 The main image was taken in Bookshell Bindery’s studio in the Percy Williams Building.